Other Distinguishing Features: Cool Rockin’ Daddy has bat-like ears and protrusions from his chin. He also speaks in rhyme. When several heroes were in pitched battle with the Rats within the Danger Zone, Fire Lord and his army of Demon Dogs joined the fray. 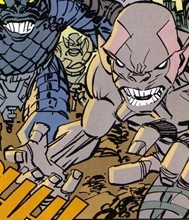 These super-freaks threatened to overwhelm the heroes until they were eventually driven off. Red Giant had grown too large for her brain to work properly and her aggression levels increased to the point that she seemingly crushed the villains all to death with debris. Fire Lord later dug himself out of the rubble and formed a new-look Demon Dogs group from the survivors. The Demon Dogs carried out a brutal assault upon Red Giant and the William Jonson Star. They were all defeated by the returning Chris Robinson, using the skills he had previously employed when he had been Star. Cool Rockin’ Daddy had tried to flee but was decapitated when he ran right into razor-sharp wire.